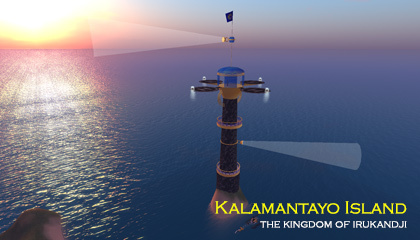 The simulator, Kalamantayo Island is a region in Kalamat State in farwestern Irukandji. At the time of its creation, Kalamantayo Island marked the most southwestern point of the continent. 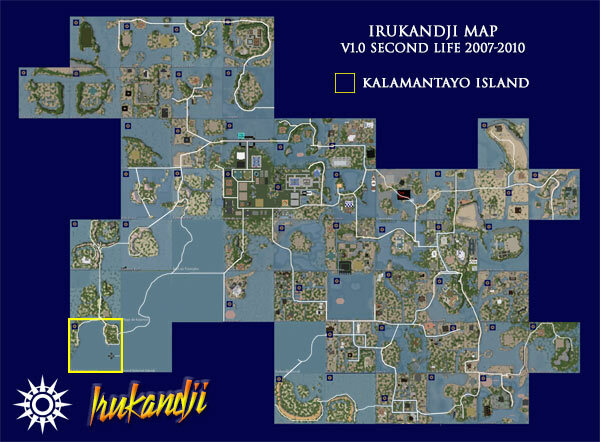 This was only surpassed eight years later in 2016 with the development of the Aratura sim on the DigiWorldz grid, which lays further west that Kalamat. The deepwater region is predominantly open ocean. Two small shoals occupy the north of Kalamantayo Island. The Trans Irukandji Causeway feeds into Kalamantayo Island from Plage de Kalamat in the east, and New Batavia in the north. Neighbouring regions to Kalamantayo Island are New Batavia, Plage de Kalamat, and Grand Kalamat Island. In the south of Kalamantayo Island, stands the 120 metre tall Goodwill Lighthouse.